Indexes are used by queries to find data from tables quickly. Indexes are created on tables and views. Index on a table or a view, is very similar to an index that we find in a book. If you don't have an index in a book, and I ask you to locate a specific chapter in that book, you will have to look at every page starting from the first page of the book. On, the other hand, if you have the index, you lookup the page number of the chapter in the index, and then directly go to that page number to locate the chapter. Obviously, the book index is helping to drastically reduce the time it takes to find the chapter. In a similar way, Table and View indexes, can help the query to find data quickly. In fact, the existence of the right indexes, can drastically improve the performance of the query. If there is no index to help the query, then the query engine, checks every row in the table from the beginning to the end. This is called as Table Scan. Table scan is bad for performance. Index Example: At the moment, the Employees table, does not have an index on SALARY column. 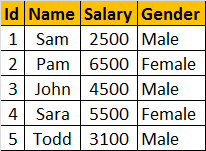 To find all the employees, who has salary greater than 5000 and less than 7000, the query engine has to check each and every row in the table, resulting in a table scan, which can adversely affect the performance, especially if the table is large. Since there is no index, to help the query, the query engine performs an entire table scan. The index stores salary of each employee, in the ascending order as shown below. The actual index may look slightly different. 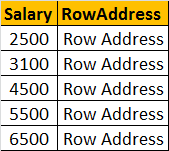 Now, when the SQL server has to execute the same query, it has an index on the salary column to help this query. Salaries between the range of 5000 and 7000 are usually present at the bottom, since the salaries are arranged in an ascending order. SQL server picks up the row addresses from the index and directly fetch the records from the table, rather than scanning each row in the table. This is called as Index Seek. 1. In the Object Explorer, expand the Databases folder and then specific database you are working with. To view the Indexes: In the object explorer, expand Indexes folder. Alternatively use sp_helptext system stored procedure. The following command query returns all the indexes on tblEmployee table. Your instructions are so clear and easy to understand.Thanks. excellent demonstration. i am very impressed by seeing all this videos. going to make one library for this. very good and very impressive work from you. this will take lots of effort and patience.exceptional work dear.. Your tutorials are so easy to understand. Thanks so much for all your hard work. I loved your text explanation and all the video tutorials. To add to this - Indexes can be created on either a single column or a combination of columns in a table and are implemented in the form of B-trees.B- Tree is sorted on the search key and can be searched efficiently! I am very grateful for all the knowledge learned, thank you very much Pragim. Nagendra , Thanks for rectifying the mistake . Sp_help shows all information but prior shown only about indexes. Below, please find the SQL Query for creating the tblEmployee table. Your explanations are the best Venkat! Execute sp_helptext tblEmployee to Execute sp_helpindex tblEmployee.